Galerie Durand-Ruel, Paris (acquired from the artist circa 1875). John G. Johnson, New York (acquired from the above in September 1889). Durand-Ruel Collection, Paris (acquired from the above circa 1895). G. Grappe, L'Art et Le Beau, Claude Monet, Paris, 1909, p. 63 (illustrated). M. Liebermann, "Claude Monet," Kunst und Knstler, vol. XXV, 1927, p. 168 (illustrated). J. Rewald, The History of Impressionism, New York, 1946, p. 282 (illustrated). L. Degand and D. Rouart, Claude Monet, Paris, 1958, p. 60. L.R. Bortolatto, L'opera completa di Monet, Milan, 1966, pp. 94-95, no. 93 (illustrated, p. 95). P.H. Tucker, Monet at Argenteuil, New Haven, 1982, pp. 87, 106, 108, 110-111, 118 and 189 (illustrated in color, p. 86, fig. XVIII). ed. M. Raeburn, Renoir, exh. cat., Hayward Gallery, London, 1985-1986, p. 205 (illustrated). J. House, Monet: Nature into Art, New Haven, 1986, pp. 188-189, (illustrated, fig. 237). R.L. Herbert, Impressionism: Art, Leisure, and Parisian Society, New Haven, 1988, pp. 239-242, (illustrated in color, pp. 238 and 240, pls. 240 and 242). D. Wildenstein, Claude Monet, Catalogue raisonn, Lausanne, 1991, vol. V (Supplment aux peintures, dessins, pastels, index), p. 29, no. 324. J. House, Impressions of France: Monet, Renoir, Pissarro, and Their Rivals, exh. cat., Hayward Gallery, London, 1995-1996, p. 216 (illustrated). D. Wildenstein, Claude Monet, Catalogue Raisonn, Cologne, 1996, vol. II (Nos. 1-968), p. 136, no. 324 (illustrated in color). B. Ehrlich White, Impressionists Side by Side, New York, 1996, pp. 70-71 (illustrated in color). Paris, Galerie Durand-Ruel, Monet, March 1883, no. 12. Berlin, Galerie Paul Cassirer, Ausstellung VIII. Jahrgang, winter 1905, no. 11. Paris, Galerie Durand-Ruel, Paysages par Claude Monet et Renoir, May-June 1908, no. 16. Paris, Galerie Barbazanges, Le Sport dans l'art, art ancien et moderne, peinture, sculpture, gravure, architecture, etc., November 1922, p. 15. Paris, Galerie Georges Petit, Exposition Claude Monet, January 1924, no. 55. New York, Durand-Ruel Gallery, Masterpieces by Claude Monet, March-April 1933, no. 11. New York, Durand-Ruel Gallery, Claude Monet, October-November 1935, no. 2. Paris, Galerie Durand-Ruel, Claude Monet de 1865 1888, November-December 1935, no. 21. Basel, Kunsthalle, Impressionisten: Monet, Pissarro, Sisley, Vorlufer und Zeitgenossen, September-November 1949, p. 29, no. 127 (illustrated). Zurich, Kunsthaus; Paris, Galerie des Beaux-Arts, and The Hague, Gemeentemuseum, Monet, May-September 1952, nos. 37, 28 and 31. Paris, Galerie Durand-Ruel, Exposition Claude Monet, May-September 1959, no. 16 (illustrated). Paris, Galerie Durand-Ruel, Claude Monet, January-February 1970, no. 10 (illustrated). Hamburg, Kunstverein, Franzsische Impressionisten: Hommage Durand-Ruel, November 1970-January 1971, no. 22 (illustrated). Tokyo, Seibu Museum of Art; Kyoto, Municipal Museum, and Fukuoka, Cultural Center, Claude Monet, March-July 1973, no. 9. Paris, Galerie Durand-Ruel, Hommage Paul Durand-Ruel: Cent ans d'impressionnisme, January-March 1974, no. 28 (illustrated in color). Paris, Grand Palais, Hommage Claude Monet, February-May 1980, pp. 128-129, no. 39 (illustrated, p. 129). Washington, D.C., The Phillips Collection, Impressionists on the Seine, September 1996-February 1997. Portland, Art Museum, Seine of Argenteuil and Sailboats of Argenteuil, Renoir and Monet, winter 1997, p. 5. This beautiful and legendary picture is an archetypal Impressionist image and a classic document in the history of nineteenth century art. Following the First Impressionist Exhibition in April of 1874, Monet returned to Argenteuil, a small hamlet west of Paris on the banks of the Seine; and Manet took up residence in Gennevilliers on the opposite bank of the river. That summer Renoir came to Argenteuil for an extended stay, and Sisley also visited Monet and Manet. The four artists concentrated much of their energy on depicting the Seine, and especially the yachting that took place there. It was a golden moment in the development of Impressionism. The artists joined in friendly rivalry as they pushed and inspired one another to advance in the new style. As part of this competitive collaboration, they often painted the same themes; Monet and Renoir even painted the same views side-by-side. The present work is the result of this sort of competition. The companion picture (fig. 1), by Renoir, represents the same boat and dock and was painted at the same time from a viewpoint just a few feet further to the right. Almost certainly it was Monet who selected the site, the boat rental area on the south bank just west of the new highway bridge (fig. 2). This was one of Monet's favorite sites for painting; he depicted nearly every aspect of it from every angle (figs. 3-4). By carefully controlling his viewpoint, Monet determined what elements of the scenery would be included or excluded. He thereby created compositions of surprising diversity, some seemingly more urban and crowded, others (such as the present picture) more rustic and free. Monet moored his floating studio by the foot of the dock that is represented in the present picture (see fig. 4). It is not clear whether Monet and Renoir made their companion pictures from the floating studio or from a spot on the bank nearby. Monet and the other Impressionists were deeply interested in depicting leisure activity as a part of modern life. More than any other sport, yachting was considered the most chic and Argenteuil was the center of this fashionable sport. The conditions at Argenteuil were particularly auspicious for boating as the Seine is deeper and broader there than anywhere else in the environs of Paris. As Le Sport wrote in 1855, "Nowhere in the immediate vicinity of Paris does the Seine present to the amateur boater a basin as favorable in length and breadth as well as current as that at Argenteuil" (quoted in P. Tucker, op. cit., p. 90). It was for this reason that the most fashionable yacht club in the city, Cercle de la Voile de Paris, had its moorings at Argenteuil, of which Caillebotte was a member. Argenteuil was even chosen as the site for the sailing competition during the Exposition Universelle in 1867. Although the Seine in this region was also used for freight, Monet, unlike Sisley, generally avoided depicting the industry and commerce along the river. Instead he began to concentrate on yachting as a fresh subject which enabled him to paint light, and because it signified the rapturous engagement with nature that Monet was to seek all his life. 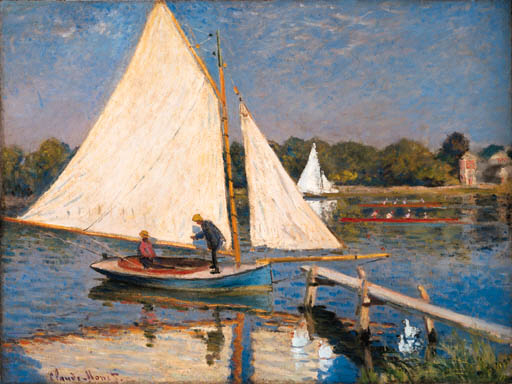 Instead of crowding his view with sailboats as Renoir does, Monet allows the large triangular shape of the sail in the foreground to fill the left side of his picture, artfully having it end just below the shoreline in the background, which seems to raise it higher and give it a lightness that Renoir's lacks. To the right, where Renoir isolates a single sailboat, Monet places a boat just at the edge of the jib in the foreground. This locks the boat into a composition, flattens the picture space, creates a complex relationship between the two sailboats and gives the background boat a great sense of movement. Below, instead of Renoir's lone rowboat and unmanned sailboat, which simply fill the space, Monet places two long, thin, parallel sculls; they too fill the void, but they define the illusion of depth more subtly by continuing the horizontal lines of the foliage, bank and foreground boom. Since one scull is further to the left than the other, there is a pleasing sense of variation, and as they are moving from right to left they also add an appealing note of contrast to the sailboats headed in the opposite direction. With the same sense of clarification and contrast Monet separates the dock from the foreground boat and places both men in the ship. As a result, the realization between the dock and the boat is easier to read and therefore more effective. Similarly, his empty left foreground (Renoir's is cluttered with ducks) and his continuous band of foliage in the background (Renoir faithfully includes the white house) make his picture simpler and more abstract. Renoir's busier and less ordered view is closer to what Argenteuil was like; Monet's view is a further transformation of the realities into a more private world of art (ibid., pp. 110-112). (fig. 1) Pierre-Auguste Renoir, La Seine Argenteuil, 1874. (fig. 2) Photograph of Argenteuil, 1870s. (fig. 3) Claude Monet, Les Bateaux rouges, Argenteuil, 1875. Fogg Art Museum, Cambridge, Massachusetts. (fig. 4) Claude Monet, Le Pont d'Argenteuil, temps gris, 1874. This painting has been requested for the exhibition The Impressionists at Argenteuil to be held at The National Gallery, Washington, D.C., May-August 2000, and The Wadsworth Atheneum, Hartford, September-December 2000. Please note that this painting was no. 29 and illustrated in color on page 187 in The Phillip's Collection exhibition Impressionists on the Seine.